Never reckon with an army of mobilized bookworms. 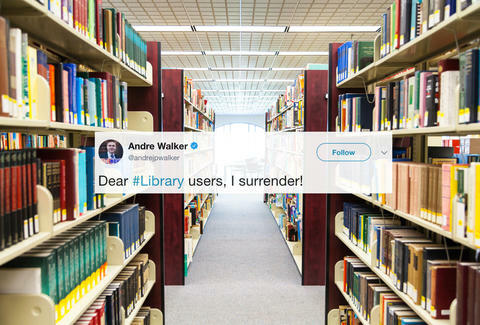 That's what Andre Walker, a columnist for the New York Observer, learned in devastating fashion earlier this week when he suggested all libraries should be shut down on Twitter. Feeding that primal urge to be heard and seen online, Walker did his work as a thinking man by posting some provocative thoughts to his Twitter followers on Monday, writing: "Nobody goes to libraries anymore. Close the public ones and put the books in schools." At first, Walker's war on libraries ruffled the feathers of just a few straphangers, who tweeted their responses at him with pictures of real people who do in fact go to libraries. But Walker, being knowledgeable and authoritative on the subject, decided to double down on his seemingly bulletproof logic. For reasons unknown, Walker then decided to compare librarians to French teachers, both of which he said are useless professions. Grasping, he made an overarching statement about how both publicly funded trades are tantamount to charity for a lowly class "who can't get proper work." He wrote: "Librarians are like French teachers. These jobs exist in order to pay the wages of sad people who can't get proper work." (It is unclear if Walker ever failed French in high school, or if working as a columnist qualifies as "proper work"). It was around this time that Walker's gradual undoing was coming to light via The Ratio™, which occurs when replies to a very bad tweet greatly outnumber any other form of engagement. Walker had unwittingly awakened angry librarian Twitter, which came roaring back with a steady stream of pointed replies. It wasn't pretty. After Halpern's rant, which gained far more traction than Walker's original tweet ever garnered, it was clear that Walker had been proven wrong, or at least overwhelmed by the onslaught of 110,000 tweets that formed in the wake of his words. Walker let down his guard and admitted that his mind was ultimately changed by the outraged library mob, which is kind of a nice coda to the whole narrative. To be fair I can't help but feel the people that set out to prove to me that libraries are popular have succeeded! In any case, never fall afoul of your local librarian.